A palm vein authentication system compact enough to be used in tablets and other mobile devices as “dependable as current optical units” has been unveiled by Japanese electronics firm Fujitsu. The company says it expects a “corresponding prevalence of highly secure mobile services” to be introduced as it aims for practical implementation of the system during 2017. Palm vein authentication uses images captured by illuminating a palm with near-infrared band light, which passes easily through the body, and reads vein patterns from the captured image. A key problem with using this technology on mobile devices, Fujitsu says, has been making the illumination and image capture components small enough to accurately scan and record users’ palms. 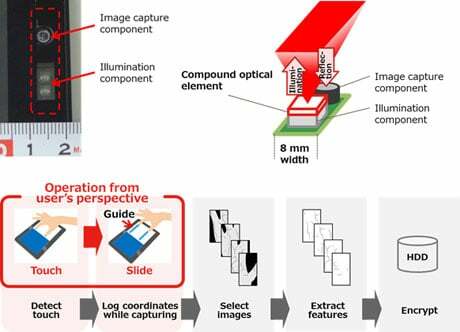 Fujitsu says it has now “miniaturised the optical unit to a mere 8mm in width, allowing it to fit within the touch panel of mobile devices”, using “optical diffraction to both scatter and focus light”. The “slide-style” system sees users slide their fingers across the touch panel of a mobile device. As the user’s palm passes over the optical unit, it continuously captures images of the palm, while coordinate data from the touch panel is also recorded. “Fujitsu has reduced the width of the optical unit for palm vein authentication to a mere 8mm, achieving a size small enough to fit in the frame of tablets or other compact mobile devices that have narrow borders,” Fujitsu says. “Furthermore, combining a slide action with an authentication algorithm means verification is just as dependable as current optical units. The announcement comes after it emerged Fujitsu is to offer a new Fido-compliant service for online biometric authentication using facial recognition obtained through camera-equipped smartphones and other biometrics, to ensure “the number of supported devices on the client side can be dramatically expanded”. The “Online Biometric Authentication Service” will initially roll out from early April 2017 in Japan, with Fujitsu “aiming to provide the service for 10m IDs by fiscal 2018” and planning to “expand the service to cover authentication on a variety of devices”. Earlier this month, South Korea’s Financial Services Commission (FSC) said it was planning to launch a pilot in the first half of 2017 that will allow consumers to make payments at the point of sale using palm vein authentication technology, without the need of a physical payment card.